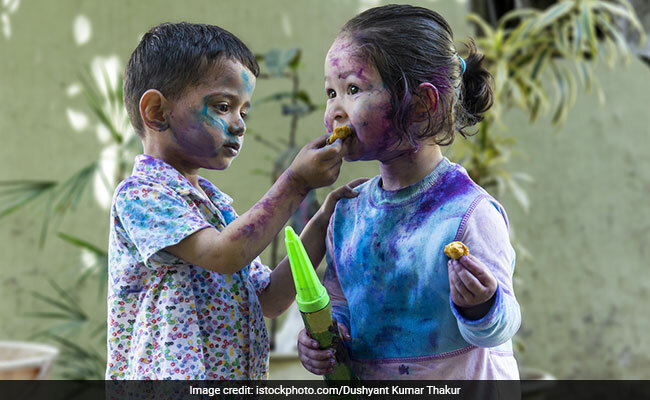 Holi 2018: 3 Reasons Why We Crave Fried Foods And Snacks On Holi! Have you ever thought about it? From Gujia to nimki to papdis and even bhallas served with dahi and tamarind chutney, everything eaten during Holi is fried. So what is the reason that we don't shy away from indulging our cravings on Holi? Have you ever wondered why all Holi food is fried? Holi is probably your last opportunity to indulge in yummy, fried treats. Holi and fried foods have an unbreakable bond. Holi 2018 is finally here and now we're already excited about the prospect of the long weekend full of colors, laughter and fun. If you're anything like us, you'd also be salivating, thinking about all the food that you'll get to eat on the day. Sweet meats and fried snacks make a bulk of the food that is typically served at homes and Holi parties on the festival. Just the idea of munching on the most sinful delights while rejoicing with your near and dear ones is makes up half the joy of this amazing festival. But we wonder why it is that Holi food is mostly made up of fried fare? 1. Because the season calls for it! Holi falls at the start of the summer season. It is advised that eating fried foods should be kept to a minimum during the hot summer months, so Holi is probably your last opportunity to indulge to your heart's content. So although fried snacks and dishes are considered unhealthy because they lead to indigestion, heart burn, etc, you just can't help but give in on Holi. Your taste buds are probably acutely aware of the fact that they won't get to taste such delicious food for quite some time. Another reason for why we crave fried foods during Holi is because of all the energy that is spent when you participate in the festive jamboree. Holi calls for a fair amount of running around with color and water balloons and chasing friends to try and make them look all kinds of colorful. You therefore may need all the calories you can get, and obviously these snacks come in extremely handy! Also Read: 7 Holi Special Beverages You Must Definitely Add In Your Party This Year! 3. Because you just can't have baked chaat! Chaat and street foods like dahi bhalla and papdi chaat are an integral part of the celebrations. Kachoris, nimki or namak paarey, samosas and aloo chaat are all highlights of the Holi meal. Although a lot of health freaks and nutrition experts have come up with 'healthier' versions of these Indian delights, they're just not as satiating as the original rich and greasy dishes. An occasion like Holi demands that you go all-out without worrying about the calories. However, if you're a diabetes patient or someone with an increased vulnerability to heart diseases, you might want to go easy on all the sweets and fried food around you. But for the rest of you out there, go ahead and indulge. It's the season to celebrate life and joy and what's more joyful than a plate of decadent crispy, gooey gujiyas? Have a happy and safe Holi 2018!